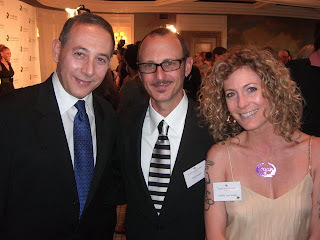 A few months ago, CHNW and I were at a fundraiser party thing in Los Angeles (note the dopey nametags) and came across Paul Reubens in the crowd. I enjoy seeing celebrities as much as anyone, but I don't usually hound them for autographs or photos. However, I'm a HUGE fan of Pee-wee Herman, so I had to get my picture taken with him. It was a big day for me and I rushed home and emailed the pic to my two adult daughters, who were green with envy. This was also a big day for CHNW, who was not only a big fan of Reubens but grew up in Sarasota just as Paul had, though a couple of decades later. In her excitement (and CNHW can get very excited) she immediately mentioned that a girl she grew up with was the daughter of a good friend of Reubens at Sarasota High School. As the words escaped her mouth, we all remembered that Sarasota was also where he was arrested, and all in attendance were flooded with feelings of weirdness. I'm sure Paul is over it by now, but it remains for me a dark period in history, as one of the most brilliant comic characters in entertainment came to an end. Paul is still acting, of course, and doing a fine job. But I'd kill to hear that Pee-wee laugh again. Meeting celebrities is often a double-edged sword. If the celeb isn't nice, it can ruin your perception of them forever, thus rendering certain movies, TV shows, music, etc. too irritating to enjoy. (That happened to me with Jimi Hendrix. I saw him once while hallucinating during a high fever and he was gratuitously unkind. I cannot listen to Purple Haze now without tearing up.) Paul Reubens was not rude, however. He was friendly and put up with our photos like a champ, but as soon as he walked away and I had a chance to look at the photo, I realized that Pee-wee Herman is taller and has more hair than I do. Will these random challenges to my self-esteem never end? Mr. Reubens is amazing, I don't care WHAT or WHERE he does it ;-) I've never seen anything with him in it that he didn't enrich with his performance. What a good-looking trio you all make too. You may not be quite rich quite yet, but you do have a bit of fun IN STYLE, no? Of course I'm referring to his brilliant and hilarious role as "the Spleen" in the movie Mystery Men. One of my favourite comedy flics. I wish they would make a sequel. I'd go, just to watch Ben Stiller(Mr. Furious) get in a rage again.